Opal began in the summer of 2000 when two young, energetic massage therapists named Sarah and Sherry dreamed of creating a healing center devoted entirely to bodywork. 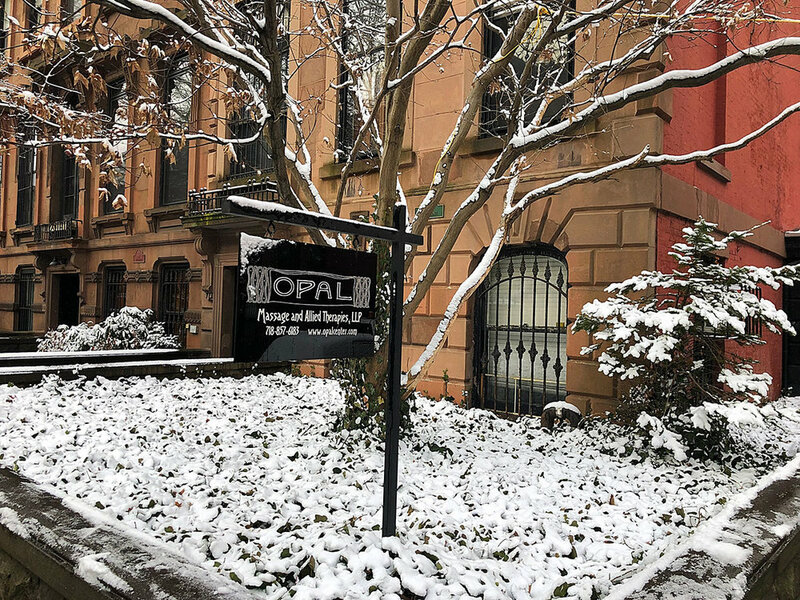 Opal was born of the desire to ground our work in a physical space that provided the tools and atmosphere necessary to provide the most transformative massage experience possible. At the beginning, chaos—and possibility! in a tiny storefront on 5th Avenue in Park Slope. It consisted of two treatment rooms, a bathroom, and a bench. Back then we did everything ourselves—designed brochures, scrubbed the floors, answered the phones, did the laundry. It was crazy, but we were so excited! All of our choices were made with a single thought in mind: How can we make a session better? There was nobody to tell us we had to do things differently to increase our bottom line. If we wanted to experiment with some new oil or a new tool or a new technique we just did it. The freedom was intoxicating and the quality of our work exploded. and within a year we became overwhelmed by appointment demand and diligently searched until we found another therapist who was as passionate about the work as we were. We found Erica and the journey continued. Very quickly, we got even busier. We slowly hired more and more therapists, each chosen according to standards we will never compromise. It eventually became clear that we needed more space and a proper office staff to help manage our growing family of therapists and clients. we closed the doors on our tiny center, bidding a fond farewell to both the space and to Sarah, who moved away to more adventures. Erica and Sherry opened the doors to Opal Massage and Allied Therapies, LLP at 28 8th Avenue, just three blocks from our original location. Only three avenues away brought us to a different world. We traded the bustle of a busy street for a brownstone on a beautiful, leafy corner. We doubled our treatment capacity and finally had the space for couple’s massage, in-house workshops and floor therapies like Thai yoga massage. We lovingly designed the new space so that it remained cozy and client-centered, which is so important to everyone here, and we are proud to continue working with the same intention, the same mission, and the same joy that inspired us to hang a shingle all those years ago. Opal has its own unique vibe. When you arrive, we’ll ask you to remove your shoes. As you take a moment to settle, you’ll probably notice that you are surrounded by an eclectic, much loved collection of spiritual icons. As you enter our main waiting area, you can begin to relax in our tranquil indoor garden, surrounded by plants and light. You will spot a shelf with our seasonally revolving oil blends for you to sniff, sample and choose for your session if you like. Books and papers appear frequently, as therapists and sometimes clients share materials from workshops they give and attend. The cross pollination of information and experience that occurs at Opal ensures that even though many of us have been doing massage for a long time, our work remains fresh and vital.